In 1997 the United Kingdom returned control of Hong Kong to China, ending the city’s status as one of the last remnants of the British Empire and initiating a new phase for it as both a modern city and a hub for global migrations. Hong Kong is a tour of the city’s postcolonial urban landscape, innovatively told through fieldwork and photography. 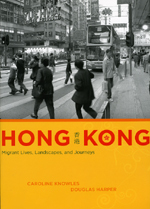 Caroline Knowles and Douglas Harper’s point of entry into Hong Kong is the unusual position of the British expatriates who chose to remain in the city after the transition. Now a relatively insignificant presence, British migrants in Hong Kong have become intimately connected with another small minority group there: immigrants from Southeast Asia. The lives, journeys, and stories of these two groups bring to life a place where the past continues to resonate for all its residents, even as the city hurtles forward into a future marked by transience and transition. By skillfully blending ethnographic and visual approaches, Hong Kong offers a fascinating guide to a city that is at once unique in its recent history and exemplary of our globalized present.